The color red is most associated with energy, passion, and action. The color is warm and makes our minds think of our physical needs and our will to survive. It has a strong masculine energy and can often be linked to strength and power. Its color can help excite the emotions and motivate people to act, plus it signifies a pioneering spirit and leadership qualities, promoting ambition and determination. Associated with energy, war, danger, strength, power, determination as well as passion, desire, and love. The psychology of color has found that we perceive colors differently as each has its own unique message. The color red is one of the basic colors, and it is one that immediately draws our attention. Here are some of the associations that red has. It is the color associated with energy and aggression. Red has an effect on our physiological state, since it increases heart rate and makes us breathe faster. 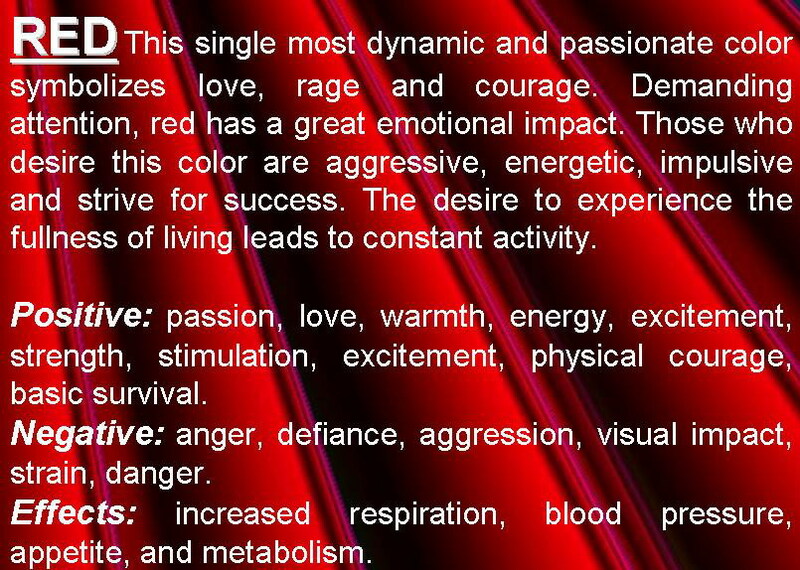 Red is very noticeable, so an overuse can be irritating or provoke aggression. A red accent on a neutral background can help draw attention to a single element. It has been found that athletes wearing a red kit in combat sports had a bigger chance of winning than those who wore a blue kit. Red makes the person feel more aggressive and more powerful, boosting testosterone, but it also changes the perception others have. 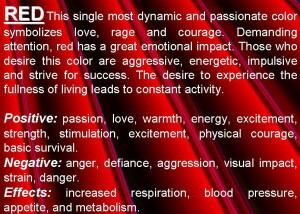 Red is also the color linked to sexuality and desire. People wearing red are consistently rated as more attractive by others. For example, waitresses in red usually get higher tips than those wearing a differently colored uniform. Considering that it draws attention, it’s easy to see why it’s so often used in warning signs. Red has to do with the body’s fight-or-flight response, so too much red leaves the person feeling not just alert, but also stressed out. Symbolically, red can be linked to life and passion, as well as to bonds of romantic and familiar love. It’s often used in romantic presents, like Valentine’s Day, and to express love, for example, by giving red roses. Its variations include colors such as scarlet, crimson and others. The connotations of each variation may vary. Darker colors, like maroon or burgundy represent an action that is more restrained and sophisticated. Brighter shades, like scarlet, imply more energy and less dominance. In general, red has both positive and negative connotations. The positive aspects are that it represents love, activity, energy, attention and power. The negative aspects refer to aggression, dominance that instills fear, danger and stress. It’s a very basic and important color, but it’s one that needs to be used with moderation. There are different shades of red that can all represent different feelings as well. Maroon has a darker blue tint mixed into the red and often denotes control and thoughtful action, where burgundy has a dark purple tint to the red and is known to be more sophisticated and serious, it is also the less energetic color out of all the reds. Crimson has very little blue in it and indicated determination to succeed but has a note to it that doesn’t upset people. Crimson can also emit sensuality. Scarlet has orange mixed into the red and gives richness and brightness. The color can promote enthusiasm and love of life. It is a fun-loving color and a little less intense then a true red. Red is my favorite colour. It is the one which is liked by many. My name is Christian, I am a first year high school student. We are preparing to do research work, in which I have decided to investigate colour blindness, since I suffer from this defect. I would like to be able to contact a specialist in this field, to do an interview, and also to be able to expand my information. Thank you, I’m looking forward for your answer. i am not very impressed with some of your comments. Have a better attitude and be grateful for the information we are given. Red is a good color and symbolizes a lot of things. Do all the comments have to be made by idiots? noo, onlee bie smert idiuts. I find that when I wear maroon shades,colours within/etween the red/violet spectrum, people will approach me and ask me where certain addresses are. This seems to happen more often than when I’ve worn my typical rowns, greys and darkest hues. This is just an o-servation that I’ve tested within the past month. Perhaps people are conditioned in Toronto to the maroon, reddish colours worn y the TTC operators. Anyway, interesting article and thank you for posting.